In 1977 during a clean up, a small Freighter van was brought back to Mawson from the Moore Pyramid camp in the northern part of the Prince Charles Mountains (not far from the current Mt. Jacklyn camp) It was still in its original form, with cyclone mesh fold-up bunks and 1950s smell and the 1978 expeditioners were quick to realise its potential. At the time, there was only one hut in the Framnes mountains and that was at Rumdoodle, so it was decided to place the hut at Mt Henderson. It was towed into the only position to do it justice, high on the saddle, and if one looks at the mountain there is nowhere else a caravan could be placed. (except in the melt lake area, but the magnificent view would be lost). In 1983 the hut was returned to Mawson, and the interior refurbished by the station chippy, who placed the manufacturer's plate (Freighter Industries Serial No. FB611) on the end bunk. It was returned to its site the same year and has been there ever since. The hut suffered a small fire in the insulation between the walls in 1984, due to static on a radio aerial, and luckily it survived. Mt Henderson hut is the closest hut to Mawson in the Framnes mountains and is a good place to escape for the weekend and the base camp for climbing to the summit of Mt Henderson and exploring the surrounding area. 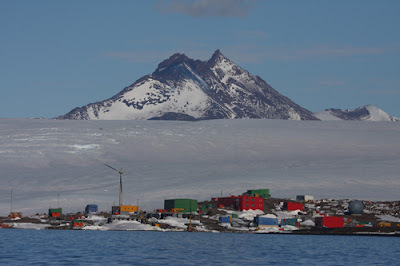 Mount Henderson is a massive mountain, 970 metres (3,180 ft) high, rising through the ice sheet eighteen kilometres southeast of Mawson station and forms the eastern boundary of the Framnes mountains, in Mc Robinson land, Antarctica. It was discovered in February 1931 by the British Australian New Zealand Antarctic Research Expedition (BANZARE) under Sir Douglas Mawson, who named it after W. Henderson, Director of the Australian Department of External Affairs, and a member of the Australian Antarctic Committee in 1929. Mount Henderson is a beautiful mountain and is the first dominating feature you see when sailing into Mawson station and makes for a stunning sight. It has the classic pyramid mountain shape rising up to a pointy summit which I have climbed twice now. On the summit is a garden tap and a double power outlet. Shortly there will be a telephone as well. This gives expeditoners an excuse to go out and do some routine maintenance. History dictates a plumber must carry with him a large eight kilo gram pair of stilsons on his first climb. This is classic polar humour. Hi Craig, good to see this blog is still alive! I did some research in relation to lenticular clouds above Mt. Henderson and your blog came up first!